Are you a photographer interested in improving your photo editing quality and workflow? Maybe Sleeklens has the answer? Invest a few moments and read my Adobe Lightroom preset review for Sleeklens’ Through the Woods Workflow. Details About the Review of Sleeklens’ Presets? 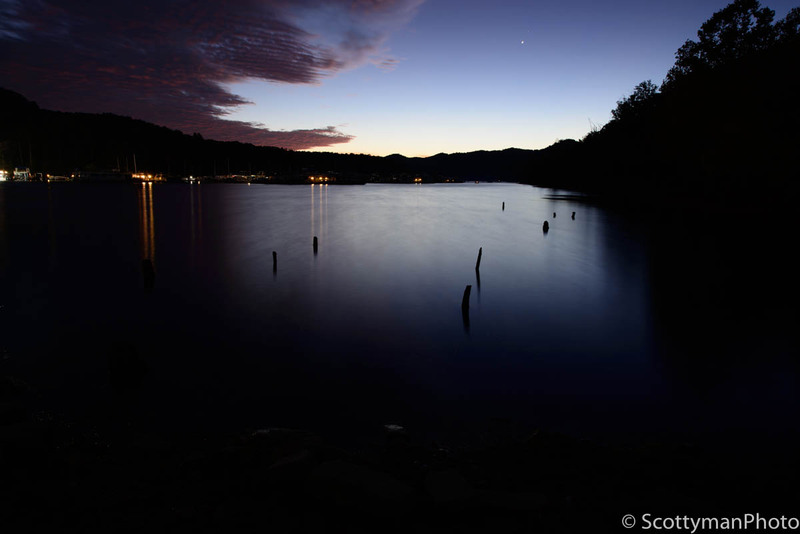 Fine art landscape photography can require considerable post-processing. Therefore, I’m always interested in cutting down on editing time without sacrificing quality; however, I want the best image with the least amount of processing time. When Sleeklens asked me to consider reviewing their Through the Woods Workflow, I initially thought of how few presets I really use. In fact, excluding a few default Lightroom presets, I only use two. However, I couldn’t pass up the opportunity for a Lightroom preset review. Although I wasn’t in the market for new presets, I decided to take on the challenge and give an honest and unbiased evaluation. To provide the best Lightroom preset review possible, I decided to forgo my usual processing method and process two recent RAW images using only Sleeklens’ Through the Woods Workflow. What is Your Goal When Processing an Image? Although I’m not a huge fan of heavily processed images, indeed, beauty is in the eyes of the artist. Still, it’s important to understand my position on processing images. Personally, I like to keep processing simple without oversaturation or adding artifacts. Naturally, my style of processing differs from others. Thus, as a landscape photographer, I attempt to recreate the scene as close as possible to the same vibrant colors nature intended. Conversely, many great images push the limits of processing and look fabulous; It’s merely an artistic expression no different from an artists’ canvas. In any case, now that you know my style of processing, it’s equally important to understand that I never considered using Lightroom presets because of fear of over processing. Also, I want full control over the editing process. Nonetheless, upon completion of the Lightroom preset review, I now have a new perspective to share. Results of Sleeklens’ Adobe Lightroom Preset Review (Through the Woods Workflow). After careful review, the results of using Sleeklens’ Through the Woods Presets far exceeded my expectations. The Lightroom presets proved to save processing time without over processing. The presets were simple to download and easily installed. Sleeklens’ website provided easy to following, well-presented instructions with videos detailing the entire process for both Windows and Mac. Overall, I found the collection very useful in my photo processing. In fact, the Through the Woods Workflow contains a variety of all-in-one presets designed to do just that; one click and done. Additionally, if the preset effects appear too strong or weak, the user can merely tweak the settings to taste. A few presets only apply adjustments to the basic panel in Lightroom while others apply profile corrections and remove chromatic aberrations. While using the presets, I discovered new ideas and methods of processing I hadn’t previously considered, an unexpected benefit. Additional Information on Sleeklens’ Through the Woods Workflow. Sleeklens’ Through the Wood Workflow currently contains 80 presets and 42 brushes, many of which apply to Lightroom’s graduated and radial filters. Many of the preset default settings tend to oversaturate areas of the image for my taste while others are on point. In fact, the Add Golden Sun preset, available in all filters as well as the brush, has an absolutely stunning effect and is no doubt my favorite. At a price of $31.00, the Through the Woods Workflow is an excellent value for any photographer looking to save a bit of time on processing while adding a stunning pop to their photographs. Upon completion of my Lightroom preset review, I would not hesitate to recommend these presets, whether you’re an advanced or novice photographer. 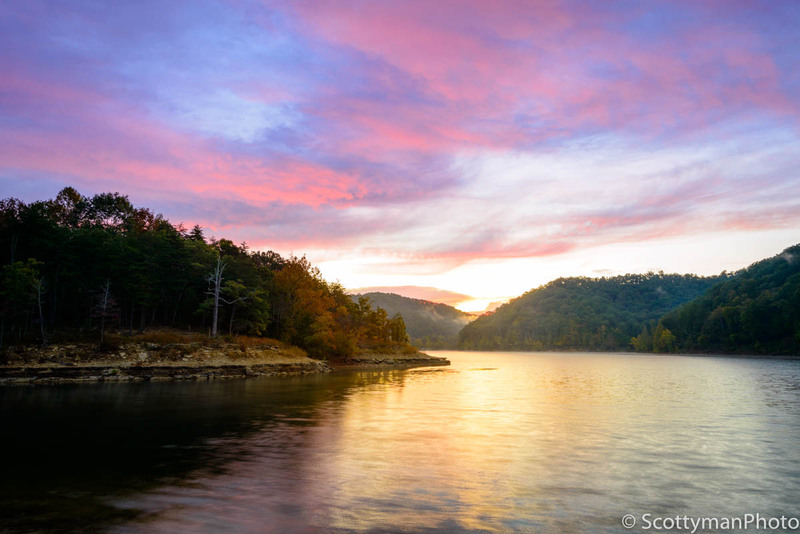 An unprocessed RAW image of a sunrise captured over Scott Marina at Cave Run Lake in the Daniel Boone National Forest in Kentucky. 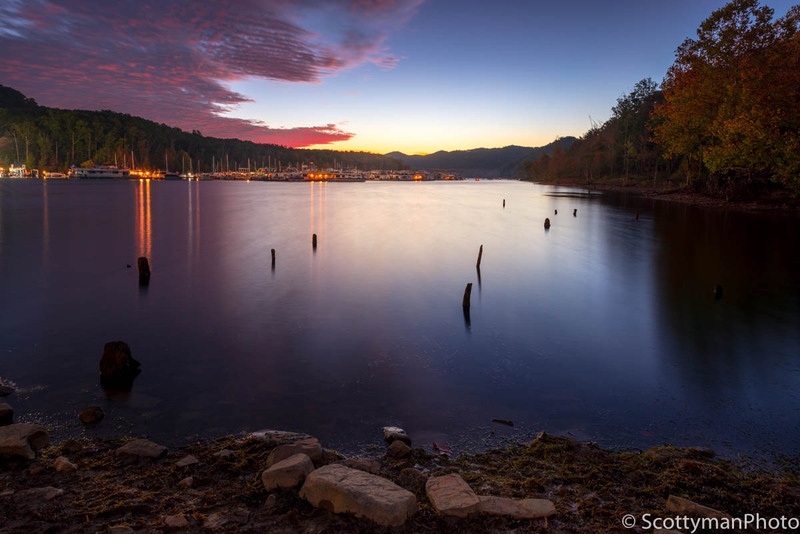 The same image of Scott Marina processed with Sleeklens’ Adobe Lightroom Presets using Through the Woods Workflow. 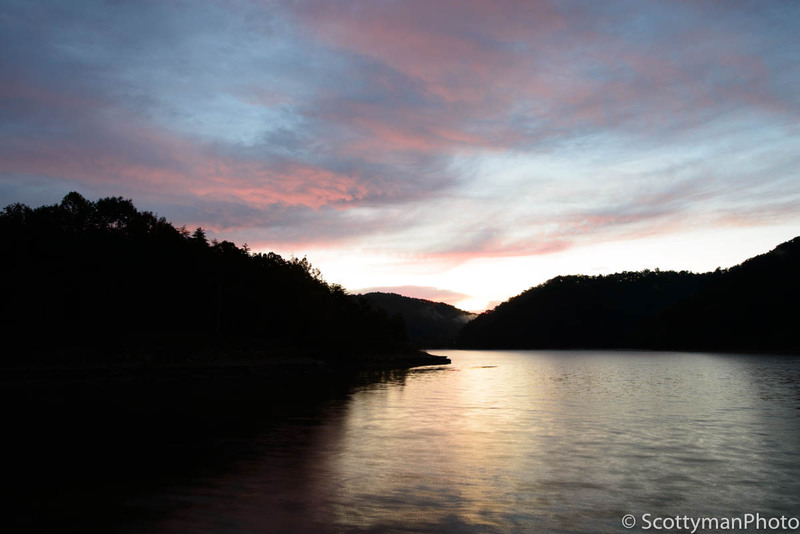 An unprocessed RAW image of a sunrise over Cave Run Lake in the Daniel Boone National Forest. The same image of a Cave Run Lake processed with Sleeklens’ Adobe Lightroom Presets using Through the Woods Workflow. The presets are easy to install, and there’s no learning curve, just plug and play. Adds creativity and promotes new ideas in editing. Most adjustments provide subtle changes without scorching your images. Huge time saver! Quick and easy to apply, many of the “all-in-one” presets deliver impressive results. 80 presets with 42 brushes. In addition to brushes, the presets also allow for use with graduated and radial filters. Preset effects may be stacked and layered. The Add Golden Sun preset provides a stunning punch to any sunrise or sunset. All preset effects are adjustable to suit your style of editing. Priced by collection sets or bundles. Through the Woods Workflow collection costs $31.00. Price is subjective and may seem high for many people. At $275, the entire collection is pricey. Depending on one’s preference, some presets may require tweaking. Some people suggest using presets hinders creativity. A few effects appear either over or undersaturated. It’s easy to get carried away and overcook one’s image. Initially, I didn’t think this review would end with such a high rank. However, upon completing Sleeklens’ Lightroom preset review, I found myself enjoying them very much. Also, the installation is straightforward, and the presets are simple to use. In fact, the Through the Woods Workflow helped me cultivate new ideas and processing methods. In my opinion, the creative aspect alone was enough reason to spend $31.00. Beneficial for the novice and professional, these presets have something to offer any Lightroom user. I recommend visiting Sleeklens’ website and check out all of their presets and pricing. Click here to visit Sleeklens’ Through the Woods Workflow.